Discovering mold is a nightmare for any building owner or care-taker. Mold can develop in as little as 48 hours wherever excessive moisture is present. After water damage has occurred, mold is to be expected. Beyond the grotesque appearance of mold growth and the foul odors emitted by active mold colonies, inhabitants of mold-infested structures may also face allergic reactions – itchy eyes, sneezing and nasal congestion – when exposed to the presence of mold. Depending on the sensitivity of the individual, skin rashes, fever, wheezing or shortness of breath may occur. When it comes to mold, time is the enemy. That’s why our goal at ServiceMaster by Marshall is to remove mold as quickly as possible. To help achieve that goal, ServiceMaster by Marshall's technicians and project managers complete a comprehensive company training program to ensure the latest technology is used in the mold remediation process. The most effective drying techniques require us to use sensitive tools to measure and record the temperature, humidity and moisture content of both the home or building and its contents. We follow detailed, operational procedures based on the IICRC and EPA Standards for proper mold remediation. 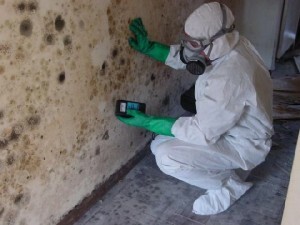 This allows us to determine the best mold remediation procedure based on the type of mold, affected areas and extent of the damage. Best of all, we offer clients standardized line-item pricing accepted by most insurance companies.